A tool chest is the ultimate storage device for holding and organizing tools. These chests come in various sizes, shapes, and colors, so it is easy to customize to get exactly what you want and need. Tool chests are also almost always crafted from a steel design that offers the most durability. They also will have compartments and drawers that can be filled with both large and small tools. This is the perfect storage to keep everything organized. A drawer for wrenches, another for screwdrivers. 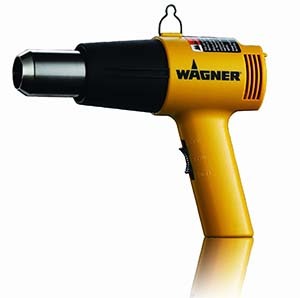 Then use larger drawers for hand held power tools like drills, jigsaws, or reciprocating saws. The best tools chests allow each drawer to be filled to capacity without overloading the tool chest. These tool and supply homes are also equipped with heavy duty wheels allowing you to move your tool chest around as needed. Tool chests provide multiple drawers in various sizes so you can separate larger tools and supplies from smaller ones, keeping you organized. This will ensure that your small materials won’t get lost amongst larger ones. Another great quality about tool chests is that they are not only limited to tools, but any supplies a person may need to store and organize. Tool chests can be very heavy pieces of equipment especially once stocked with tools and supplies so it’s best to choose a permanent location for your tool chest. This might be a garage, workshop or other location that is protected from the weather. We researched and tested 22 tool chests and after our extensive research process the Viper Tool Storage Armor Series VV7218BLT rose above its competitors. This large tool chest is 72 inches wide and 30 inches deep. 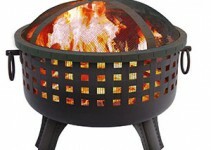 It comes with 18 drawers of various sizes and depths and is built from 18-gauge stainless steel. The slides on the drawers can accommodate up to 250 pounds’ worth of tools giving this chest the ability to handle your heaviest items. Each drawer can be locked independently and it comes with a lifetime warranty. Tool chests are valuable to anyone who owns tools. When you spend money on good quality tools you also want a top quality chest to store them in. 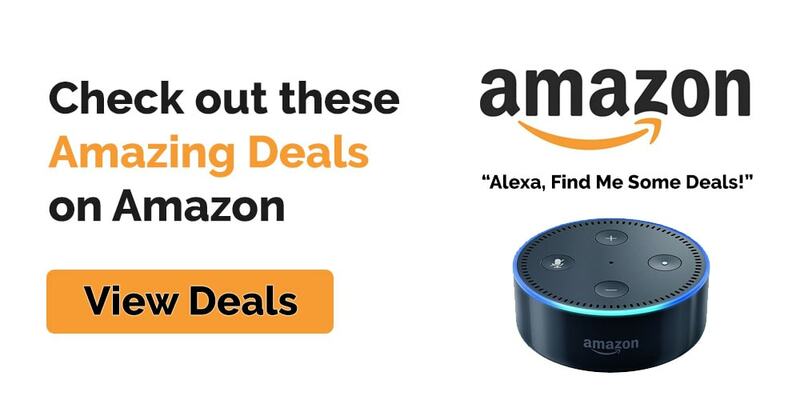 This will keep the tools safe, secure and easy to locate when you need them. Tool chests are found to be very beneficial for auto mechanic, wood workers, construction workers, homeowners who enjoy DIY projects, and anyone who has accumulated a number of tools. Anyone who needs to keep heavy tools or material organized will benefit from owning a tool chest. One of the first features to consider when choosing a tool chest is the quality of the construction. What materials were used to build the chest and how well is it put together. With the heavy weight of tools, a chest must be able to accommodate very heavy weights and still operate smoothly. Heavy gauge steel is a very common material found in tool chest design because it is durable and can handle heavy weights. The best tool chests will be crafted of steel or other heavy metals that will make your storage cabinet as durable as possible and allow you to fill your tool chest to maximum capacity without straining the frame. The second thing that will determine the tool chest you choose is the number of drawers you will need to accommodate your tools. Consider not only what you currently own but how your tools collection will grow over the years. Choose a chest that is large enough to accommodate growth. Consider the number of drawers along with their sizes and depths. Having multiple drawers can benefit your organizational structure. You will be able to separate supplies in a way that makes tools and accessories easy to locate. Smaller drawers allow easy organization for smaller tools or supplies such as nails, bolts, screws, scissors, tape, screwdrivers and wrenches. Drawers that are large or deep can accommodate larger tools such as sanders, grinders etc., which can keep your work area more open and clear. The next important feature is the wheels. Not all tool chests will have wheels but enable you to move the tool chest to different locations as needed. Tool chests become extremely heavy when filled with tools or supplies so having the added support of wheels allowing you to easily move your tool chest close to your projects. The wheels should be high quality with strong casters. Otherwise they may not be able to support the weight of a full chest. Next consider total capacity. What is the total weight that the chest is able to carry and compare that to the amount of tools you plan to store? Many consumers like to have a lock for the tool chests. Locks will either be one lock for the whole chest or locks on each of the drawers. Quality tools are a significant investment and being able to secure that investment is a high priority for many. Lastly consider the warranty. Tool chests are an investment and although they are extremely durable, a warranty will give you a way to repair or replace the chest, should it be found to be defective. We began our research by first conducting a general search for tool chests. We searched blogs and forums to discover what features users wanted and found most valuable. We then looked at durability, quality of construction, drawer variety, craftsmanship, rolling capability, loackability, and overall capacity for making our final pick. From there we reviewed tool blogs, forums, magazines, and received expert advice from professionals who use tool chests on a daily basis. We then consulted with customers to find out which tool chests held up best in real world performance. 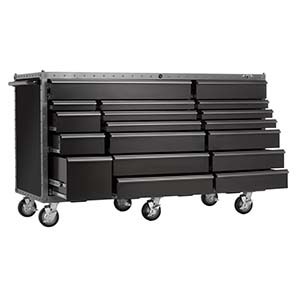 This is a one of a kind tool chest crafted of all steel for maximum durability and a 16G steel frame to provide the ultimate support system for even the heaviest materials. This tool chest also features a two hundred and fifty pound rated full extension ball bearing slides to make opening each drawer extremely easy with no lag or resistance. Another great feature about the drawers on this tool chest is that they are all lockable which is a fantastic safety feature, and will ensure that no one can gain access to your materials without you say so. 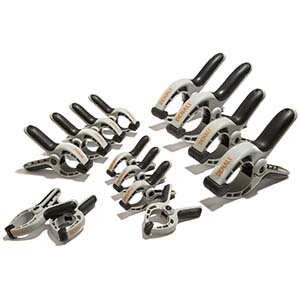 On this particular tool chest you will also find heavy duty six inch swivel casters (wheels) that will allow you to move this extremely heavy tool chest virtually weightlessly and with ease. These wheels provide extra support and the swivel motion will allow you to turn and rotate your tool chest more easily than any of the tradition wheels sets the equip other tool storage devices, and allow you to move your tool chest close than ever to your working materials saving you from have to make repeated trips to your tool box, and saving your back from any heavy lifting. 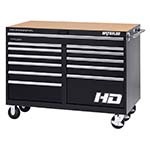 Some other great qualities about this tool chest are the extruded aluminum drawer pulls and a limited life time warranty that will protect your toll chest of almost anything that comes its way. The Viper tool chest was voted the best tool chest of 2015 by wiki.ezvid.com. For those in need of more space the step up is the Waterloo PCA-561230BK HD Cabinet with Utility Cart. This tool chest is a full extension 200-pound ball bearing drawer slides as well as drawer dividers that can be configured in various ways for organizing small tools and materials. 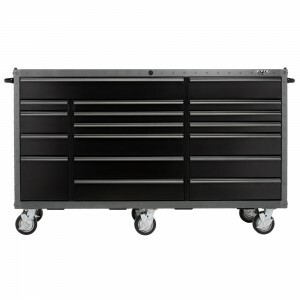 This tool chest also features a rugged roll cage that is constructed for maximum durability and the ability to carry the weight of a fully loaded cabinet with ease. The double slide drawers can accommodate up to 400 pounds worth of tools and accessories each with the total capacity of the cabinet able to support up to 5,200 pounds. It also comes with a heavy duty tool cart for transporting and maneuvering tools to and from your project. The Waterloo PCA-561230BK includes a 10 year warranty. Do not attempt to climb on opened bottom drawers or on top of your tool chest to reach out for higher items. Be aware of your surroundings when moving or rolling your tool chest as they can be extremely heavy. Always lock the wheels when your tool chest has reached its designated location to avoid unintended rolling. Always lock your drawers when leaving your tool chest unattended. Do not overload the drawers beyond the recommended weight. Keep your tool chest clean and clear of debris. Always keep your tool chest clean and organized. Repair any drawers or broken pieces before loading tools. 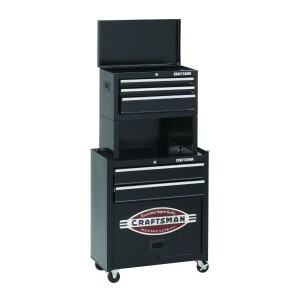 Tool chests are valuable storage equipment for any workspace whether it be your home, workshop or garage. Tool chests are extremely durable and are capable of holding all of your tools from your smallest bolts and wrenches, to your largest hand tools like drills or sanders. When you invest top dollar for the best tools, it only makes sense to protect those tools with a top quality tool chest.